Just what is this “fountain pen” thing? So you’ve decided to buy a fountain pen…. Do You Know This Waterman? 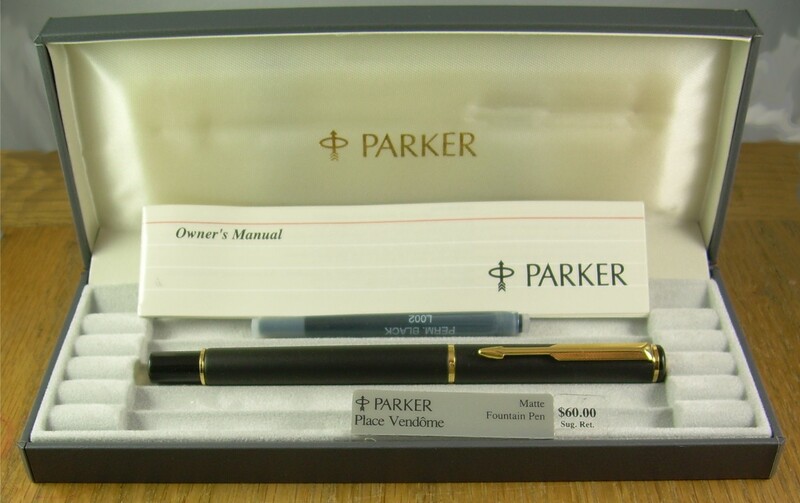 For a wonder, we find a Parker pen with a model number which has direct bearing, more or less, upon the time of its release. The 88 Place Vendôme was in part an observance of the company’s centenniary in 1988, one somewhat more affordable than the re-released Duofold. However, because pen-makers like to get the next model year into stores in time for Christmas, one sees this model drifting in at the end of 1987. The design of the thing shows its age very clearly– pens of the 1980s tended toward the metal tube shape. It is, frankly, not a decade of pen I get very excited about, and if I had not decided to try and shape the Parker wing of my collection by buying all the pens with numbers for names, I’d have passed on this one (likewise the 25). This particular body style actually started out and persists in Parker’s lower-end Vector, which was elevated for a while as the 88 through having the point and furniture gold-plated, and a little more detail applied to the “fletching” of the clip. The clip is the same as that on the 95,by the way, which shares the same release date. I have seen it suggested that the “Place Vendôme” affix was reserved for pens with the body also plated in some precious metal or other, and perhaps chased as well, but since the factory price-tag in the box my example came in says “Matte” as a colour indicator, I’m hanging onto the extra part of the name for it. I have seen other references which suggest that Parker was merely trying to tie into the snootiness of a part of Paris, in much the same way that some other things have “Park Avenue” attached to them. In 2004, this pen was renamed the Rialto, and a little slightly fradulent decoration was done to the point (little swirls which, to the willing eye, make an 88, one number on either tine). In this renaming, it swaps it’s connection to French geography for one to Italian, as Rialto is a district of Venice. The performance of this pen is best described as “about what you’d expect.” Nothing very exciting nor upsetting. The high point it offers is a very positive means of posting the cap while writing, which may be countervailed by a “clicker” in the cap which is likely to have a limited lifetime and evenutally putting the pen away may be somewhat difficult. Cost When New: Depending on finish, from $40.00 to $70.00 at the start. They adjusted to $60 to $80 in 1991 (for modern values, try this calculator). Size: 13.2 cm long capped, 15.6 cm posted, 11.6 cm uncapped. Body: Metal in various finishes. Filler: Cartridge, capacity approx. 1.2 ml. Parker 88 Place Vendôme. It is oddly devoid of date codes. Parker 88 in Corinth trim; it’s hard to make out the longitudinal stripes on this one. The Corinth also came in silver. The original box, apparently made to accept a pencil and/or ballpoint consort. The price tag shows it is from after the 1991 price hike. If you are relying on the preceding information to win a bet or impress a teacher, you should read the site’s scholarly caveat. Remember, this is the internet, and it’s full of bad information. © 2012-2019 Dirck de Lint, text and pen portraits except where indicated.